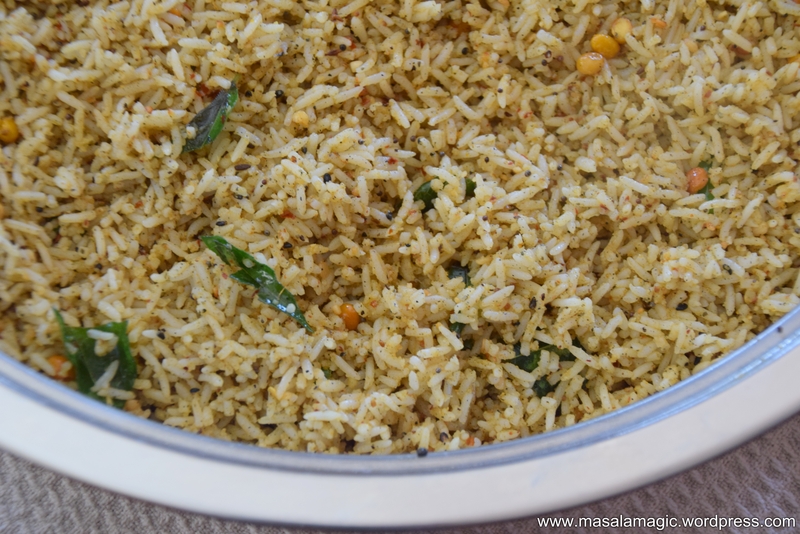 This simple, flavorful Biryani style rice is super easy to make and great for a hurried weekday lunch or dinner. Of course, this recipe came about while I was trying to finish up some fresh methi leaves and cauliflower that was lying in my refrigerator! 1. Wash the rice and cook in an electric cooker. I use the ratio 1 cup Rice to 2.5 Cups water for Sona Masoori Rice or 1 cup Rice to 1.5 cups water for Basmati Rice. While the rice is cooking you can prep all the other ingredients. 2. In a saucepan, bring 4 cups water to boil. Break the cauliflower into medium sized florets, wash and put it into the saucepan with boiling water. Add about 1 tsp salt to this water. Cover with a lid for about 5 mins. Drain. Keep aside. 3. Chop the onions, tomatoes, crush the garlic and green chillies and keep aside. 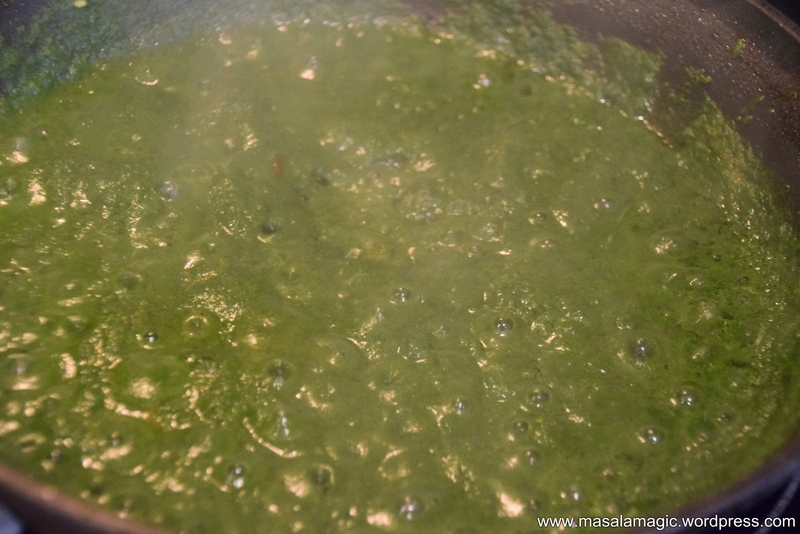 Wash the methi leaves and chop and keep aside. 4. In a pan, heat 3 tbsp Oil. Add a small piece of cinnamon, 2 to 3 cloves, bay leaf and saute. 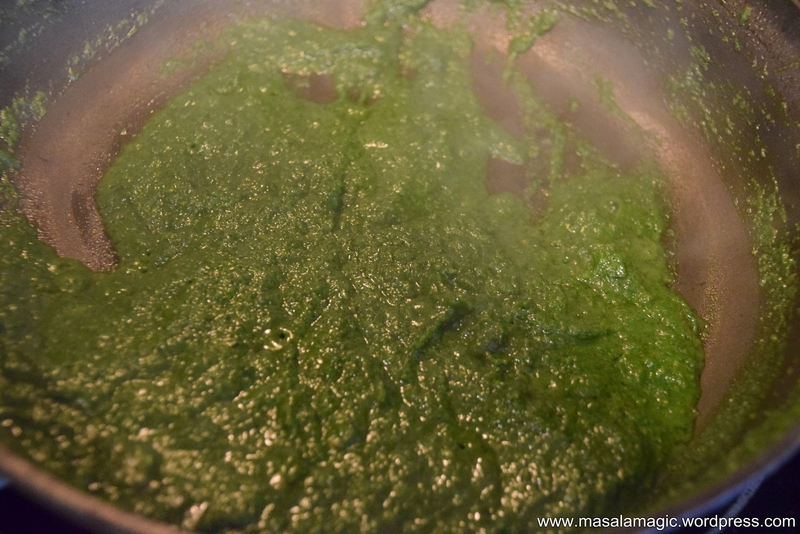 Add the chopped onions, garlic, methi leaves and green chilli and fry until the onions are golden brown. 5. Add the chopped tomatoes, the dry powders and 1/2 tsp salt and saute until the tomatoes are mushy and the mixture is oily. At this point add the garam masala powder and mix well. 6. Add the blanched cauliflower and mix well. Add about 1/2 cup water close with a lid and cook for about 5 minutes until all the water evaporates. 7. Add the cooked rice at this point, salt to taste and 1/2 tsp garam masala powder. Mix well. 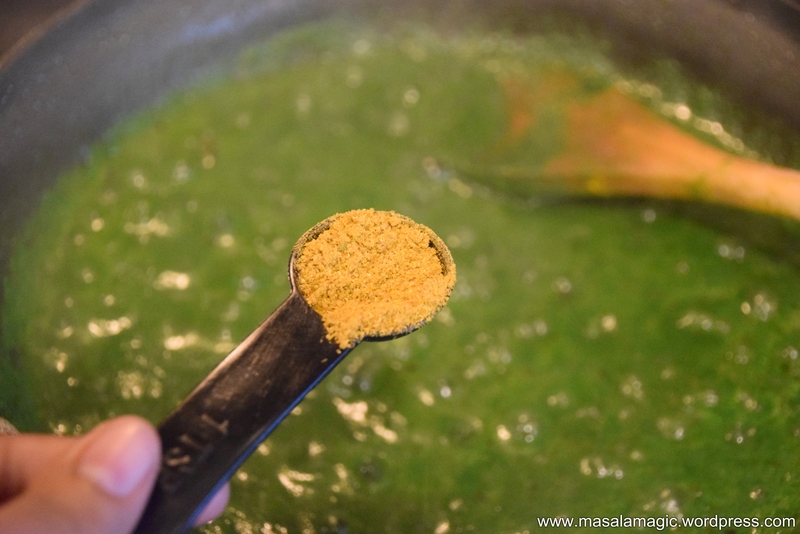 Then add the pav bhaji masala powder and mix well. 8. You can add 1 tsp ghee at this point for flavor. Garnish with chopped cilantro and serve hot. Hope you enjoyed this recipe!! Thanks for stopping by. 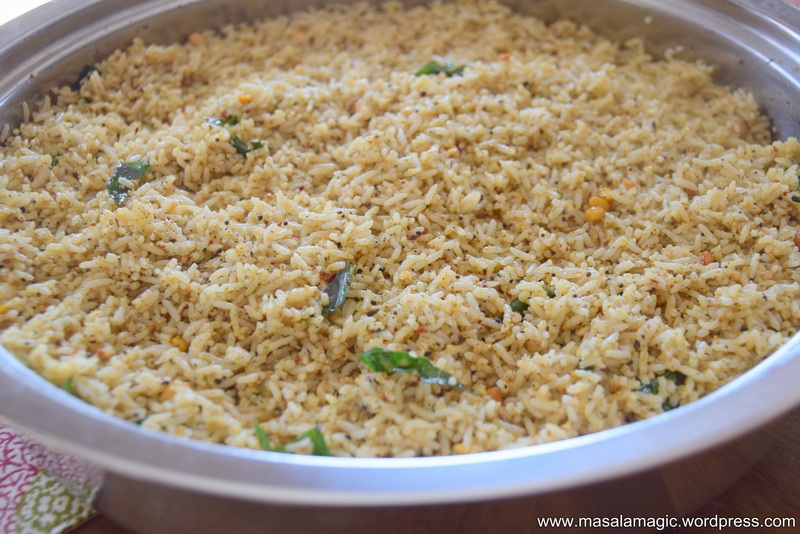 “Chitranna” is the Kannada term for “Mixed Rice”. 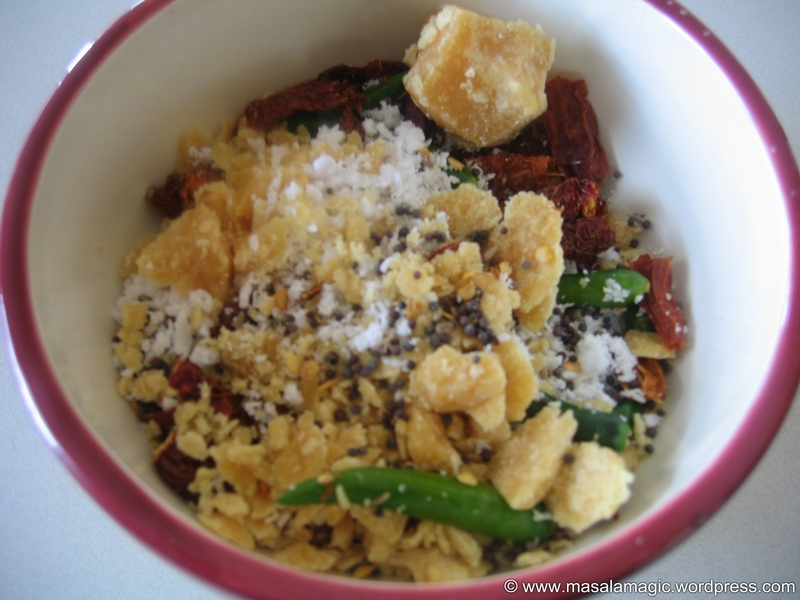 Typically every home in Karnataka makes some variety of Chitranna. Of course, our home was no exception. 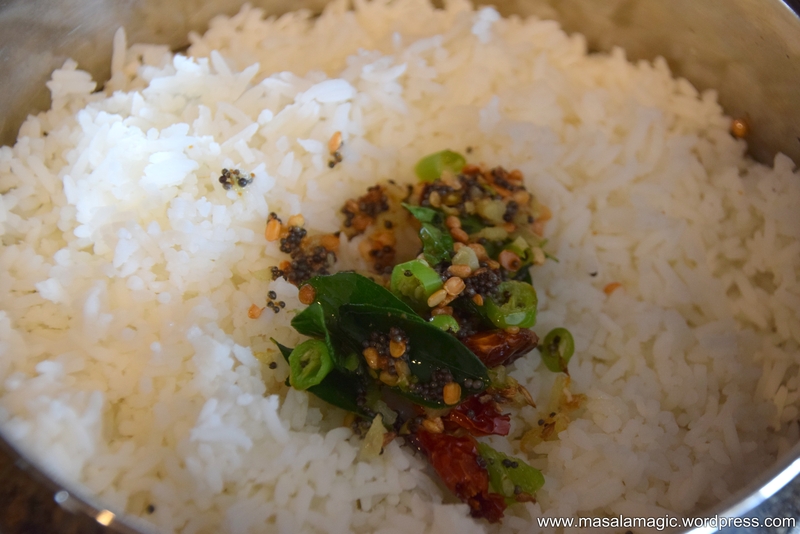 I loved eating lemon rice or lemon chitranna and can still say that it is one of my favorite rice dishes. Simple, tasty and a no fuss recipe. Many roadside restaurants in Karnataka serve some form of Chitranna on their menu on a daily basis. I have some random memories associated with most dishes. One time, I had made a trekking trip to “Ramnagaram” a small town on the outskirts of Bangalore on the way to Mysore. Just before we did some rock climbing and trekking our group stopped at this roadside little restaurant to grab a quick bite. On the menu was tasty Chitranna served with some spicy coconut chutney. For some reason, that balmy day, the lemony chitranna and spicy chutney is still fresh in my mind!! Today from the Masalamagic kitchen I will share with you two simple Chitranna recipes – Chitranna with Dill leaves (Sabassige soppu chitranna in Kannada) and Tomato Chitranna. 1. Cook rice in a rice cooker. I use the ratio 1 Rice: 2.5 cups water for Sona Masoori Rice. You may even use Basmati. 2. Once the rice is cooked, spread in a mixing bowl or platter. Add salt and the lime juice and allow to cool. 3. Meanwhile chop all ingredients as mentioned above. 4. Heat a pan with oil. Season with mustard seeds, cumin seeds and dals. Once the dals turn golden brown add the chopped onions, green chillies and curry leaves. Add 1/4 tsp turmeric powder and saute until light brown on low-medium heat (about 2 minutes). 5. Then add the chopped dill and mix well. Fry for a minute. 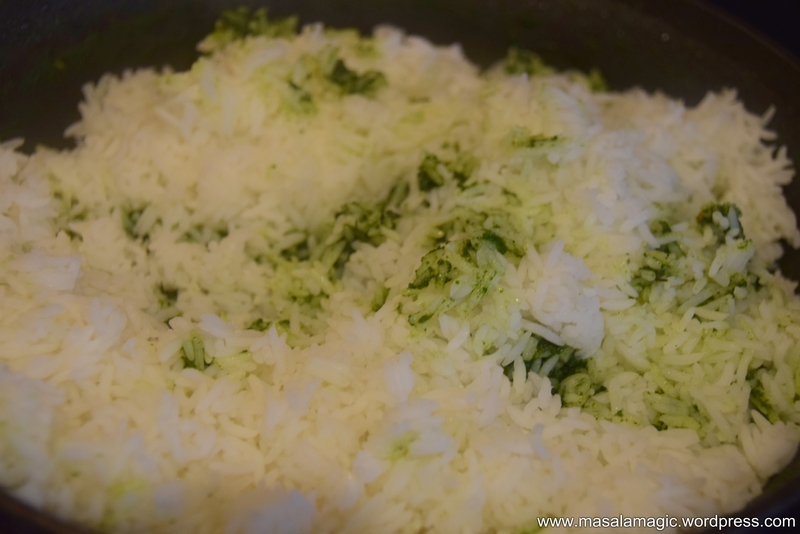 Then add the grated coconut and chopped coriander/cilantro and mix well. Turn off the stove. Add this mixture to the cooked rice and mix well. 2. Once the rice is cooked, spread in a mixing bowl or platter. Add salt and allow to cool. 4. Heat a pan with oil. Season with mustard seeds and dals. Once the dals turn golden brown add the chopped onions, green chillies and curry leaves. Add 1/4 tsp turmeric powder and saute until light brown on low-medium heat (about 2 minutes). Add chopped tomato, turmeric powder and saute for few more minutes until the oil leaves the sides. 5. Add this mixture to the cooked rice and mix well. Check for salt and adjust if needed. Garnish with chopped cilantro/coriander leaves and mix. Another simple, delicious and easy recipe from my kitchen. 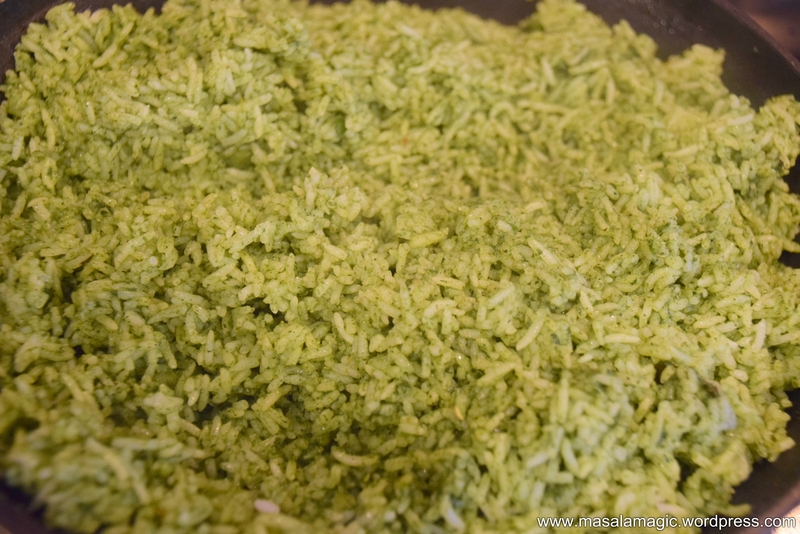 I like the look of this rice because of it’s wonderful, refreshing green color. It is also extremely easy to put together and can make for a satisfying meal. 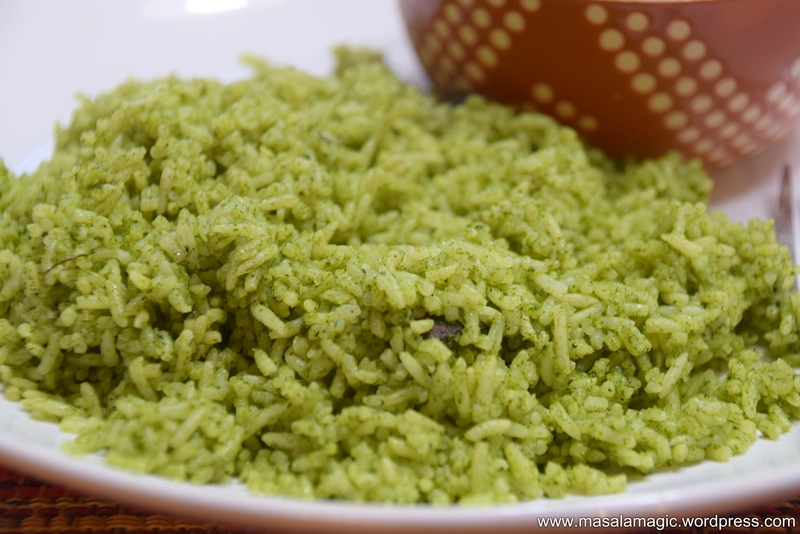 2 cups Rice – I use Sona Masoori Rice. 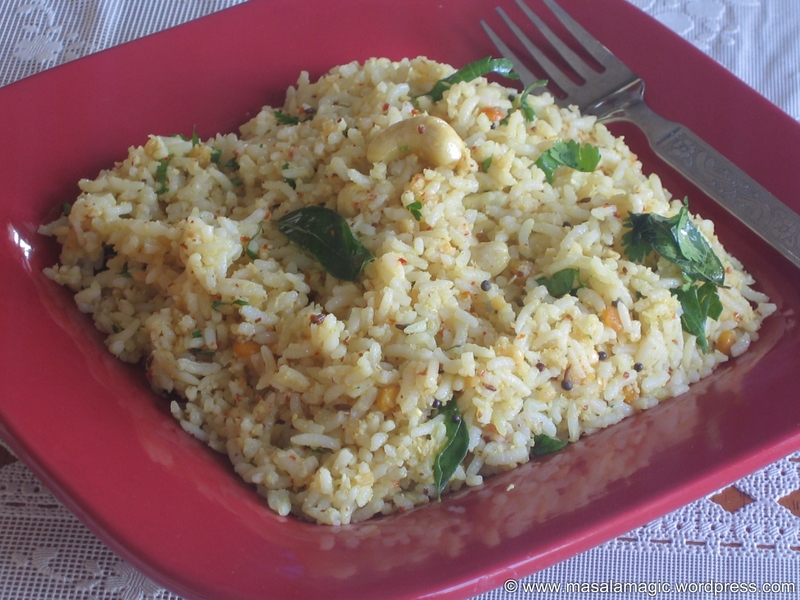 You can even use Basmati Rice for this recipe. 1. Cook the rice in a electric cooker or stove top until done. I use the ratio 1 cup rice : 2.5 cups water for Sona Masoori Rice. If using Basmati, use 1 cup rice: 2 cups water ratio. After the rice is done, spread on a large platter or mixing bowl and allow to cool slightly. 2. 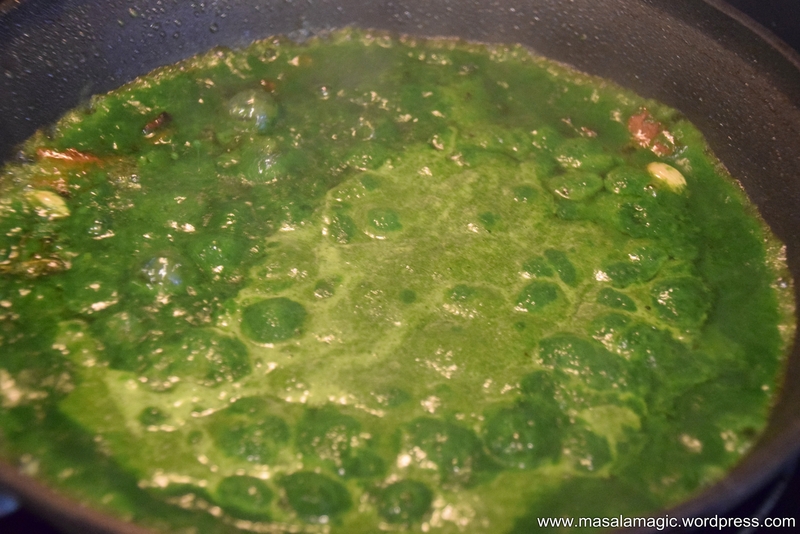 Wash the Spinach leaves (Palak leaves) and keep aside. 3. 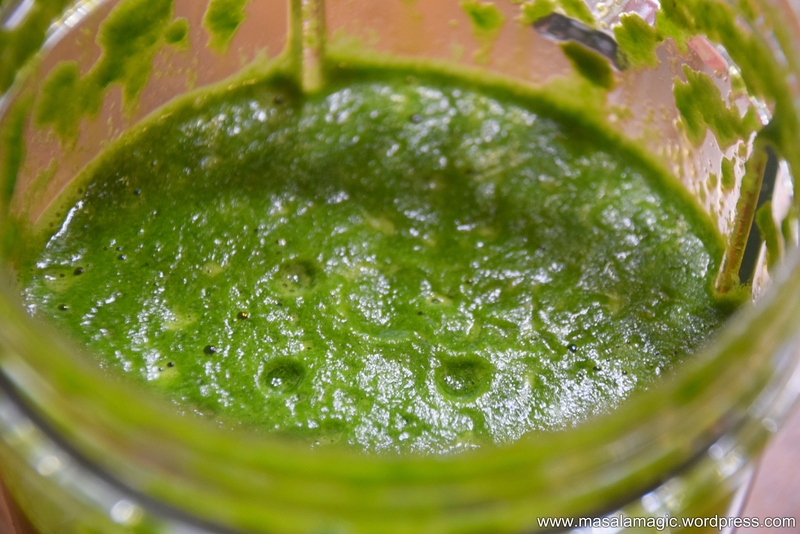 Combine the peeled ginger chunks (or grated ginger), washed green chillies and spinach leaves in a mixer or food processor. Add 1/4 cup water and grind into a smooth paste. 4. In a pan, heat the oil. Season with the whole masala ingredients. Allow to fry for a minute. 5. 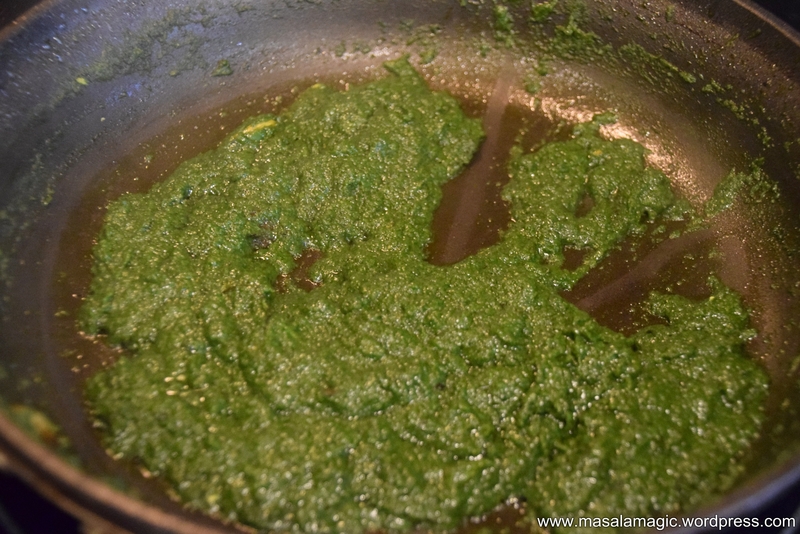 Then add the ground spinach paste. Mix well. 6. To this add turmeric powder and 1/4 tsp salt. Saute and fry the paste for about minutes by stirring in between. 7. Add the garam masala powder and mix well. Keep the stove on medium heat. You will see that all the water evaporates. This will take about 10 minutes. The paste will loose its raw smell and will come together. The oil will start to leave the sides. 8. Turn off the stove. Then add the cooked rice and salt as needed. 9. Mix well and gently. Mix thoroughly until well mixed. 10. Serve hot with raita on the side. 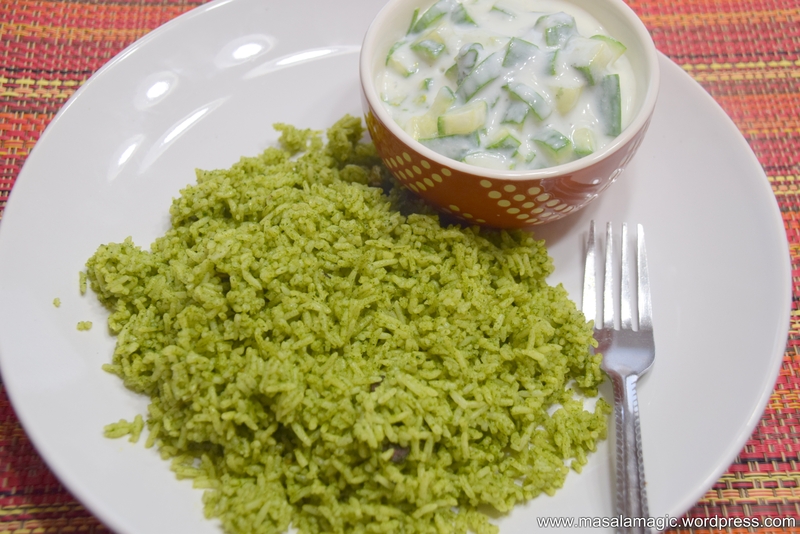 Here yummy spinach rice is served with cool and refreshing cucumber raita!! But, I added some additional spices and made this slightly different and it tasted superb! Made a slightly bigger batch to serve visiting friends that evening. 1. Cook the rice in an electric cooker. I use the ratio 1 cup Rice: 2.5 Cup water. 2. After the rice is done, spread the rice in a large platter or mixing bowl and cool. 3. To this rice add turmeric powder, citric acid or lime, salt to taste and some raw curry leaves. Mix gently and keep aside. 4. Meanwhile, In a pan add group 1 ingredients up above and dry roast until the seasame seeds start to pop. Ensure that they dont burn. Once they start popping transfer to a plate. 5. In the same pan add Group 2 ingredient i.e Urad dal, add a few drops of oil and roast until golden brown. Ensure not to burn the dal.Once golden brown, remove onto the plate along with the toasted sesame seeds/ til. 6. In the same pan, add Group 3 ingredients and few drops of oil and roast for 2 to 3 minutes. Cool along with other roasted ingredients. 7. Dry grind all the roasted ingredients in a food processor or mixer. Grind into a almost smooth powder. 8. Mix this dry powder with the already prepared rice from Step 3 above. Add salt as needed and mix.Add the seasame seed oil / til oil and gently mix into the rice. The powder and oil should be mixed well into the warm rice and should be well coated. 9. 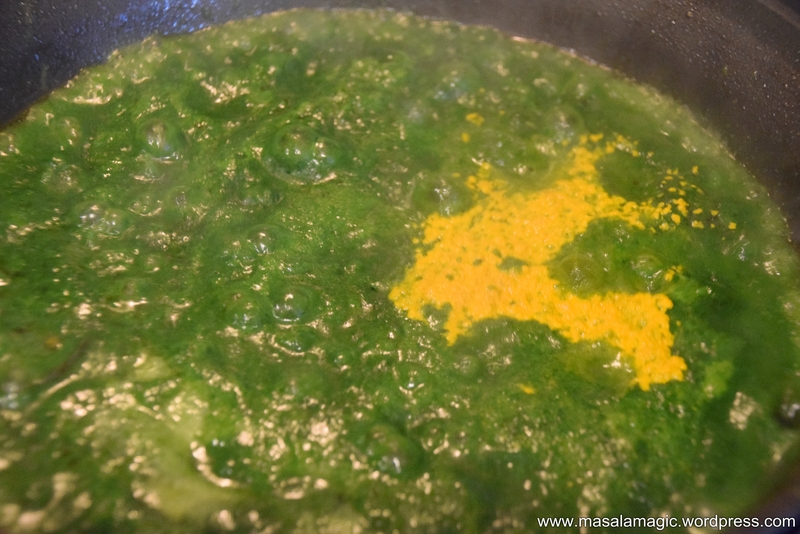 In a pan, heat the ghee (you may use oil if you prefer). Season with mustard seeds, some more hing, urad dal, channa dal and broken cashew. 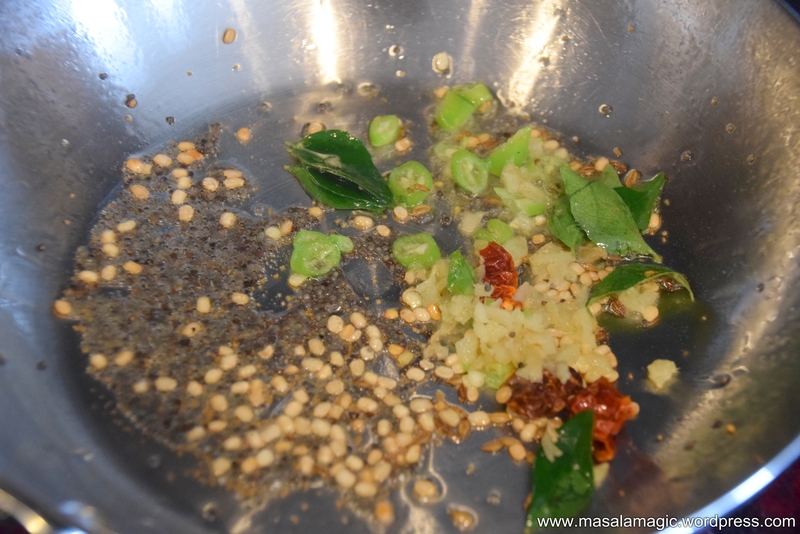 When the dals are golden brown, add a few curry leaves and broken dry chilli pieces. Mix well and pour this seasoning on the rice and mix well. 10. 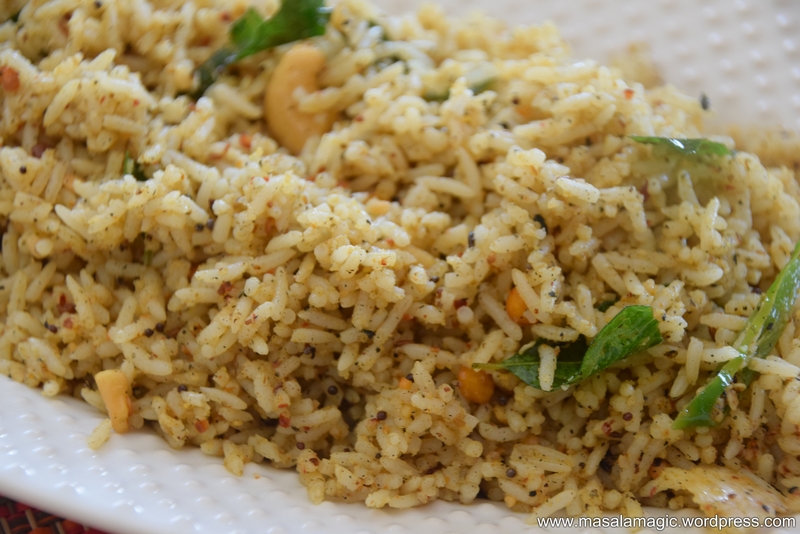 Serve delicious hot spice mix rice!! Super Tasty Spice Mix Rice is Ready!! A Request to my readers, if you do try any recipes I would love to hear from you. Nothing keeps a blogger going more than the feedback from their readers. Look forward to hearing from you. 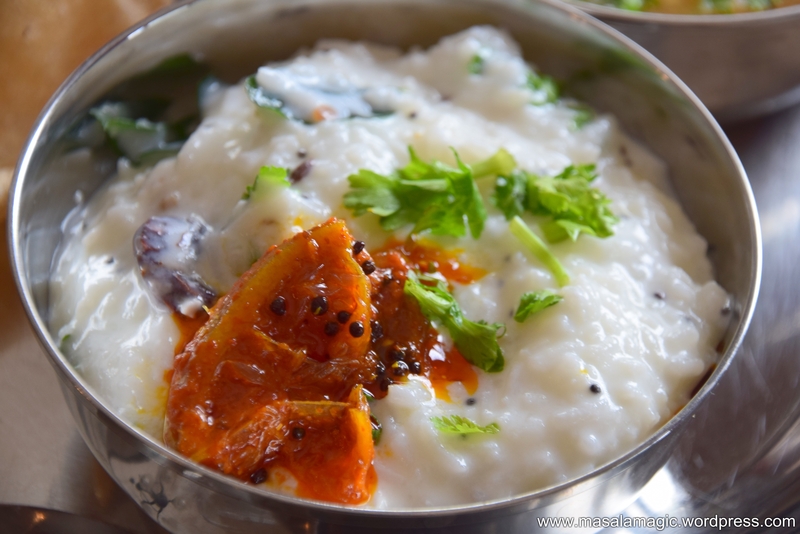 If Dal Chaawal can satisfy the North Indian Soul (it is actually comfort for any Indian soul 🙂 ), then Curd Rice is the ultimate comfort food for a South Indian Soul. 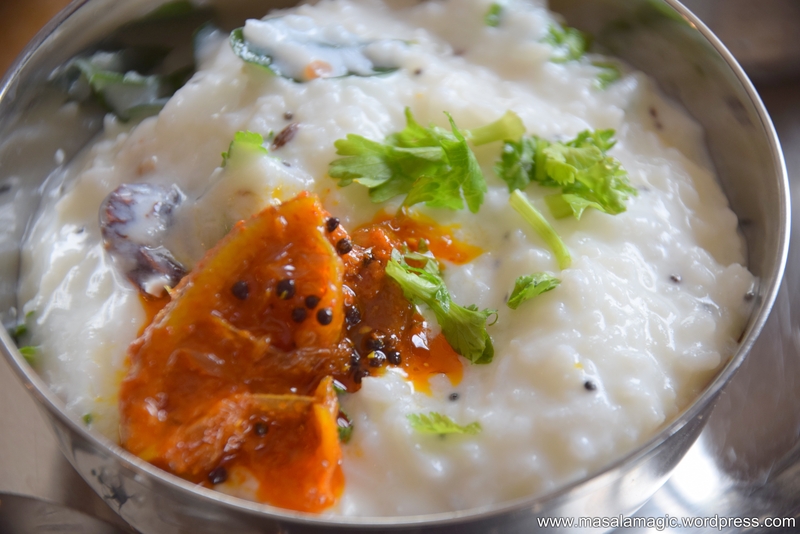 Most South Indian kids grow up on eating curd rice and definitely that sets the stage for a love for this simple yet satisfying dish. 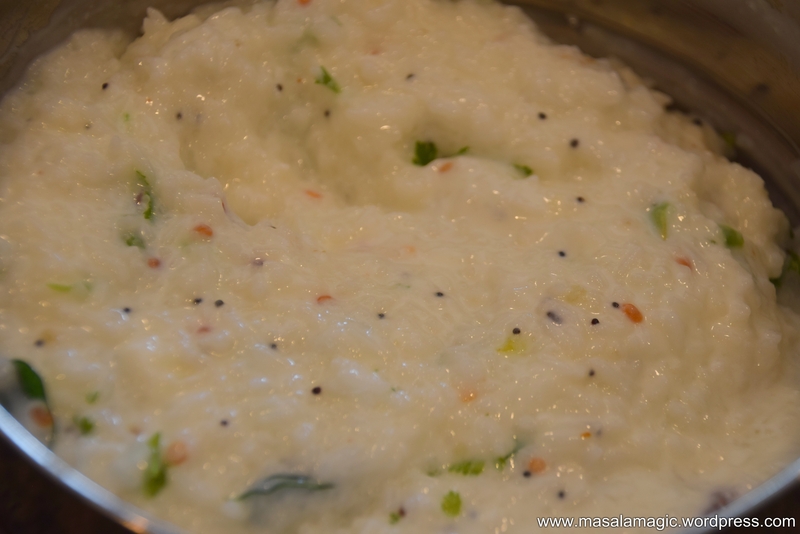 We at home love this curd rice. 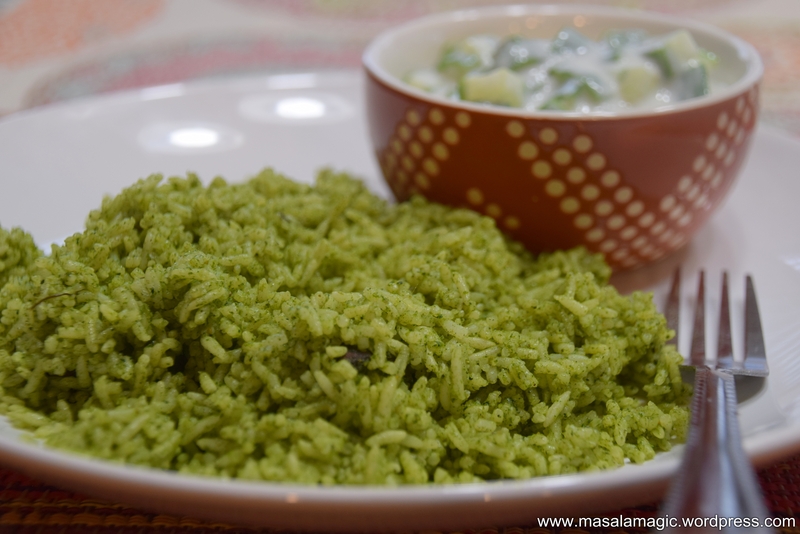 My kids call it “Seasoned curd rice” and is perfect for any meal. I usually serve it as part of a full meal or sometimes just on its own. It is not only comforting but is also very cooling and satisfying. 1. 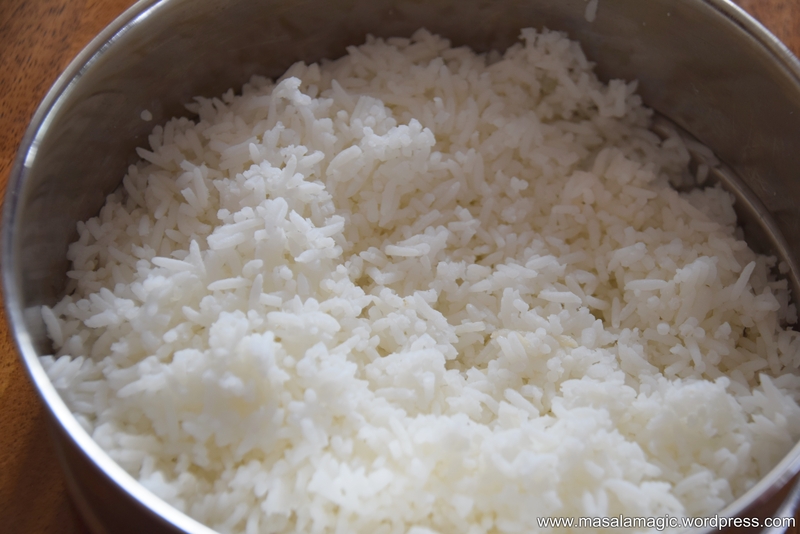 Cook the rice in a electric rice cooker or pressure cooker. Cool. With your hand mash the rice slightly. Add salt, mix well and keep aside. 2. In a pan, heat 2 tbsp oil. Add the seasoning ingredients one at a time. When the mustard splutters, add the dals and hing. 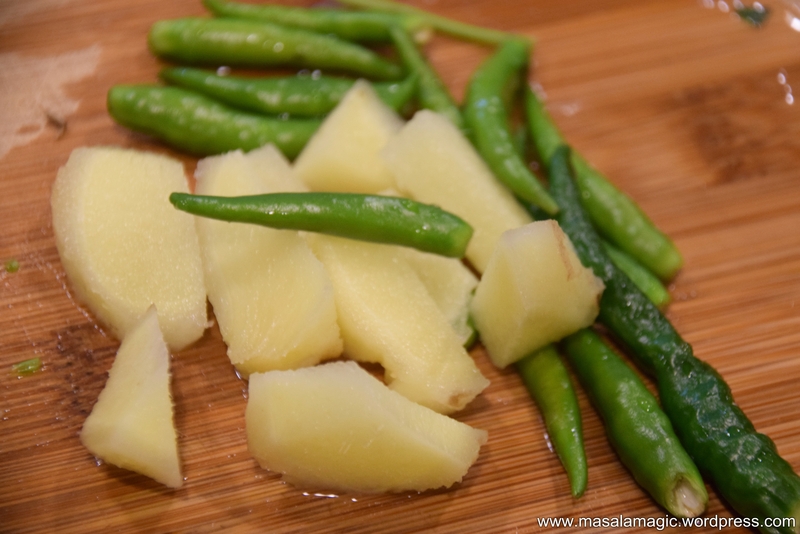 Allow the dals to turn golden brown, then add the remaining seasoning ingredients and fry for a minute. 3. Add this seasoning to the cooked, mashed rice. 4. Mix well, add chopped cilantro and mix. 5. Add the curds and mix well. 6. Serve cold with pickle on the side. Delicious curd rice is ready!! Yummy Curd Rice is ready!! 1. You can add chopped green grapes while mixing the the curds. This is very delicious too. 2. You can add pomegranate seeds into the curd rice. 3. Some people like to add finely chopped cucumber. 4. Some people even like to add sour cream to the curd rice, though i prefer not to. 5. 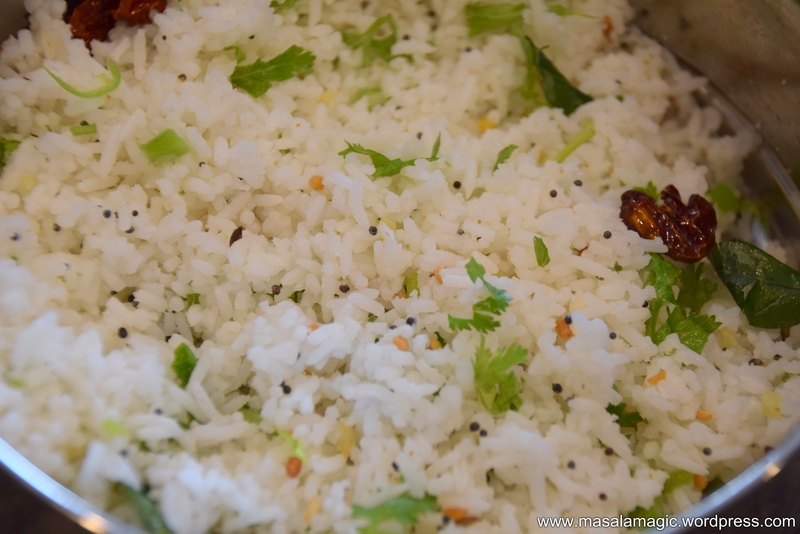 If you have fresh home made butter, you can add 1 tsp of fresh butter to the curd rice and mix. 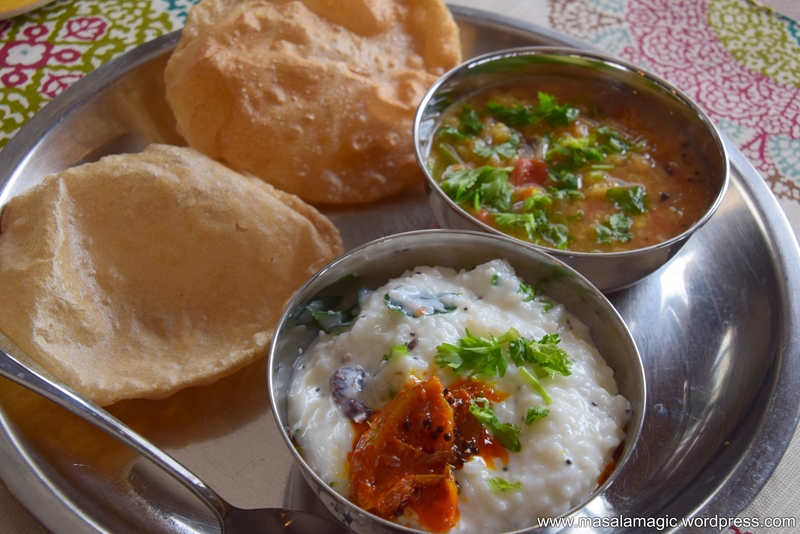 Here I have served Yummy Curd rice as part of a meal with Puri (Deep fried Bread) and Tomato Moong Saagu – my favorite combination for Puris. Recipe for Tomato Moong Dal Saagu here. Puris, Tomato Moong Dal Saagu, Curd Rice with Lime Pickle. Hope you have enjoyed my post!! Thank you for stopping by, Happy Cooking!! 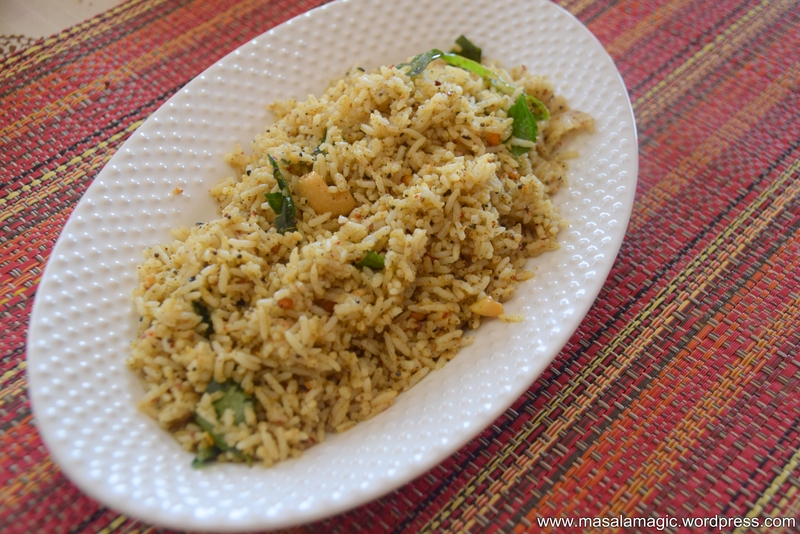 One of my favorite rice dishes – this Maharashtrian style Masale Bhaat which literally translates to “Masala Rice”. 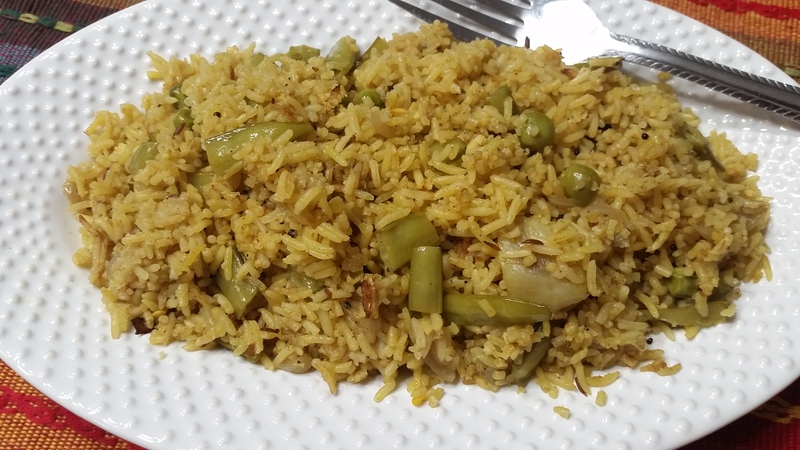 I love how quick and easy this rice dish is to put together, and the blend of vegetables I use in this dish are not typical but yet taste great! Cook the rice, cool and spread in a platter. 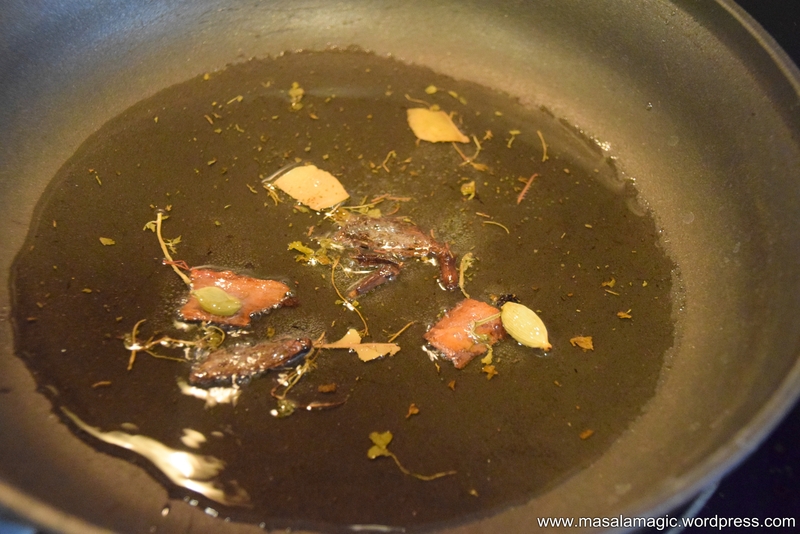 In a pan, heat the oil, add the cumin seeds and the whole spices (cinnamon, cloves and bay leaves). Add the green chillies and onions and sauté for a few minutes. Then add the chopped gavar/cluster beans, green peas, potato, salt and the dry spice powders. Mix well. Add about a cup of water and cook covered with a lid on a low flame until the vegetables are tender and cooked. Open the lid and allow all the water to evaporate. Add this mixture to the rice, some more salt if needed and mix gently. Serve hot with raita. Back from a vacation that went by too fast, I am reliving some of the wonderful memories with family as we upload pictures. I have several exciting posts that I want to write about, with all the pictures that I have taken 🙂 However, that will have to wait for now, I am on just 4 hours of sleep and a lot of caffeine..trying to get through my day so I can rest. 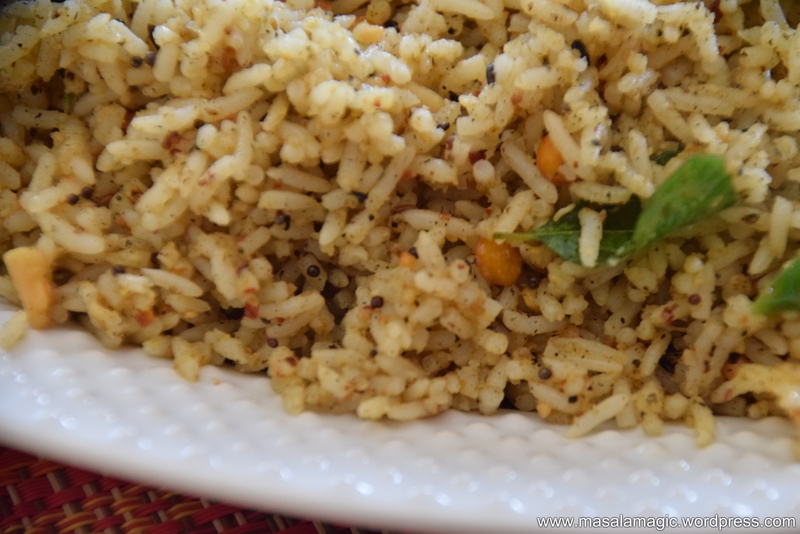 Coconut-Mustard Rice or Kai Saasive Anna, a typical Karnataka speciality..this rice is simple to make and very tasty to eat, the texture of the coconut with the sharp flavor of the mustard makes it a delicious rice dish for a quick bite on any day. Grind all of the above to a smooth paste without adding any water. Keep aside. 1. Cook the rice in an electric cooker. Cool in a large mixing bowl. 2. To this rice add a pinch of turmeric powder and salt to taste. 3. In a pan heat the oil. Add the seasoning ingredients; Allow the mustard seeds to splutter, add the cumin seeds (Jeera) and other ingredients and saute until the dals are golden brown. 4. Turn off the stove, add the paste from above to the seasoning and mix. 5. Mix the seasoning mixture to the rice. Mix gently and well. 6. Garnish with ghee roasted cashews and chopped cilantro. Serve hot.